The Samsung Galaxy Note 10.1 dispels any doubt about the return of the stylus - the S Pen transforms the tablet into something that will appeal to artist and business types alike. It's a very different experience, one that other tablets cannot match. It's not just the level of precision no finger can provide, the bundled software really extends the functionality. 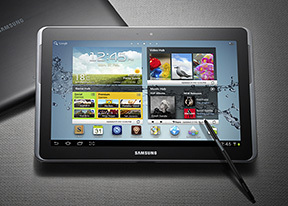 The tablet itself can be seen as a special edition of the Samsung Galaxy Tab 2 10.1 - the body is slimmer (8.9mm vs. 9.7mm), the chipset is more powerful (both in CPU and GPU terms) and the front-facing camera is much better. We won't waste too much time comparing the Note 10.1 to the Tab 2 10.1, we'll leave that comparison for the complete review. 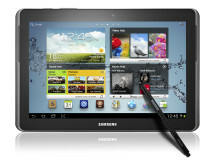 For now, here's where the Samsung Galaxy Note 10.1 stands. We can only dream of what the Note 10.1 could've been like with a tablet-sized Super AMOLED screen, but the PLS LCD used here offers pretty good image quality too. The 1280x800 resolution is the standard. It isn't much in terms of numbers, but it's perfectly alright in terms of actual image quality. The tablet runs Android 4.0 Ice Cream Sandwich imbued with TouchWiz magic. The Mini Apps that float around like windows improve the multitasking capabilities. The preloaded Photoshop Touch app is a premium addition. The note taking apps are on the level too - jotting down a memo on the Galaxy Note 10.1 is as easy as on an actual notepad. We'll warm up with a look at the hardware (which should ring a lot of bells) and move on to the interesting stuff - the S Pen, the apps that go with it and what TouchWiz brings to the dessert table. 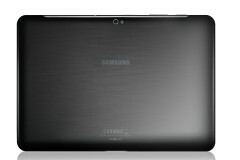 This is going to be my next tablet! I do a lot of digital illustrations and having the ability to use a digital pen on a tablet is something i've longed for. I just hope it stays below the $500 mark. Does this Note have a facility to change battery as its predecessor had..? I mean does this tablet-smartphone has any provision of a user-replaceable battery or not.. Just as Note had.